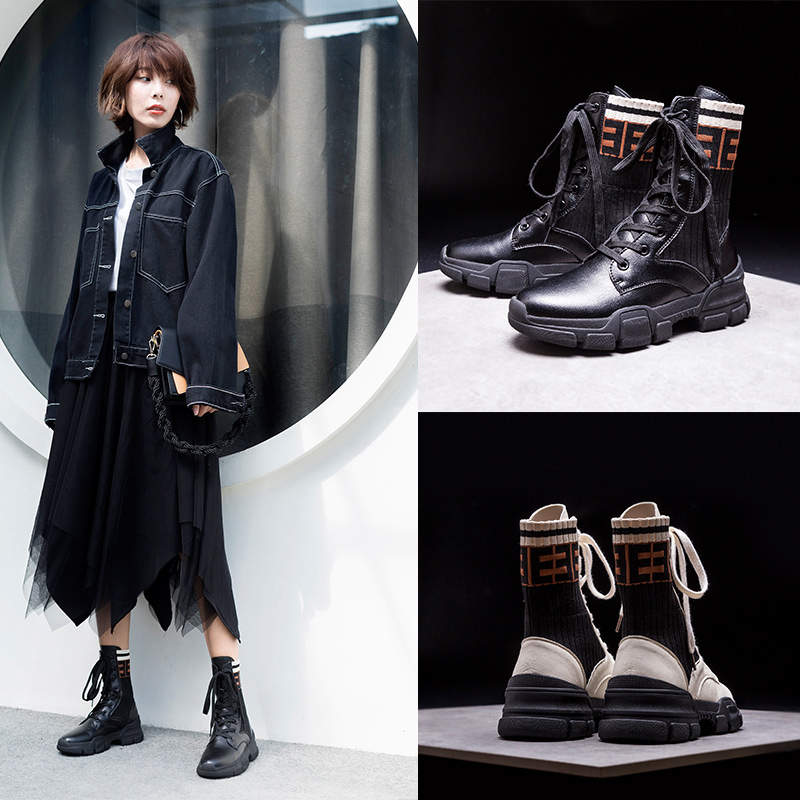 Sneaker boots, just like sock boots are a hybrid of sneakers and boots that have recently become popular in the world of fashion. 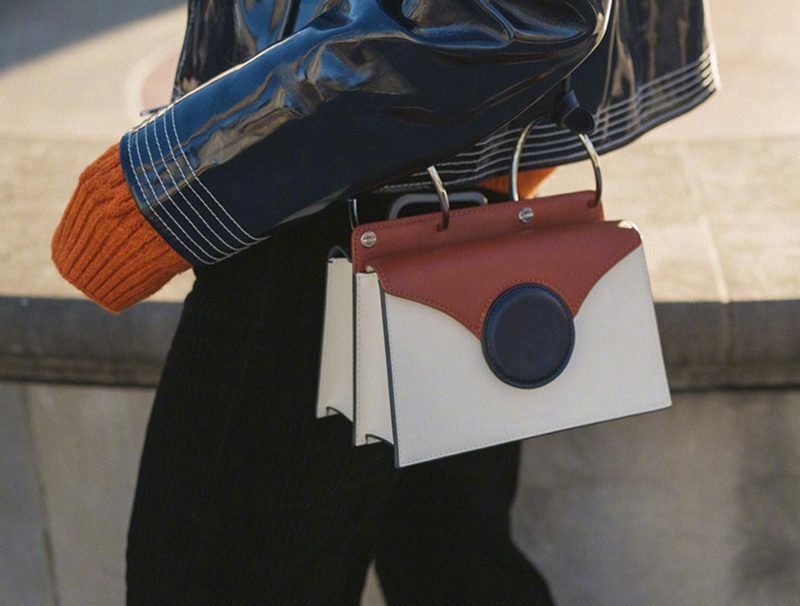 Although sneakers are only meant to be worn for sports or jogging related purposes, many brands have now taken this concept to a whole new level. The purpose of creating this shoe style is to bring comfort to the feet while having a busy day at work in which one has to constantly walk around causing sore feet. There are many more varieties available with this amazing blend of sneaker boots that brings comfort to the feet. 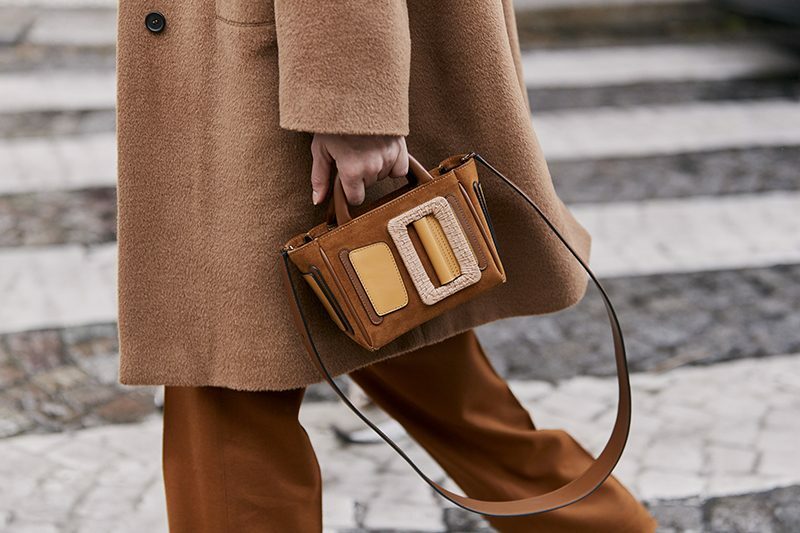 You can now dress up nicely and add in a nice pair of classic sneaker booties. They will enhance the outfit with casual touch while protecting the feet from soreness and discomfort. Here are 4 styles of sneaker boots one may wear for this winter season. 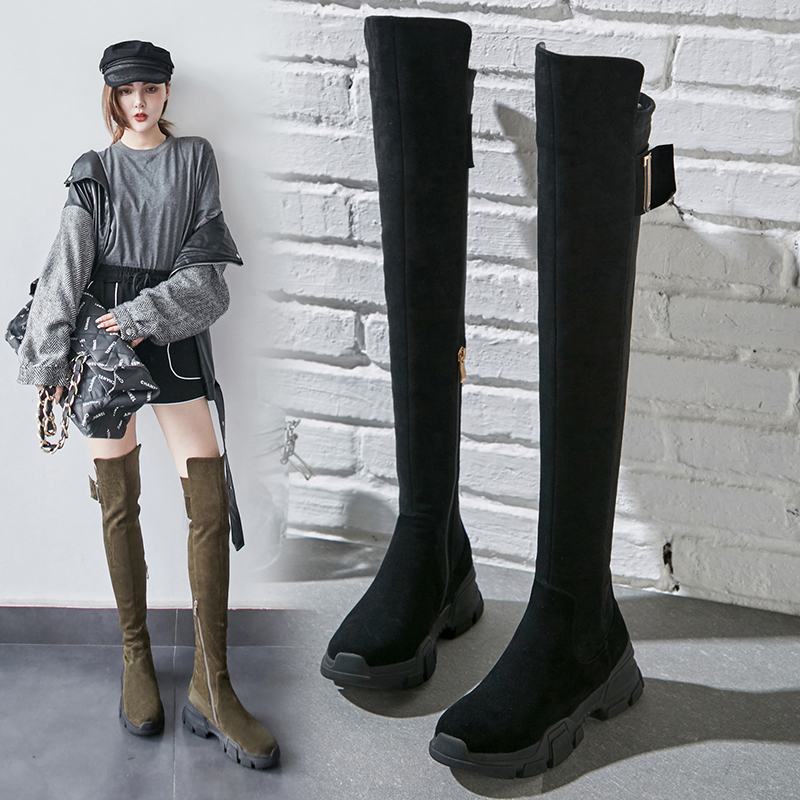 Over-the-knee boots are just what one might need during a chilly winter day in order to cover up the legs nicely so that they remain warm. These sneaker styled boots have laces that reach all the way to the top and a zipper on sides which is really eye-catching. They look perfect with short skirts or even on a pair of denim jeans. We have seen PVC jackets for rainy weathers, but now even PVC shoes are also a thing. 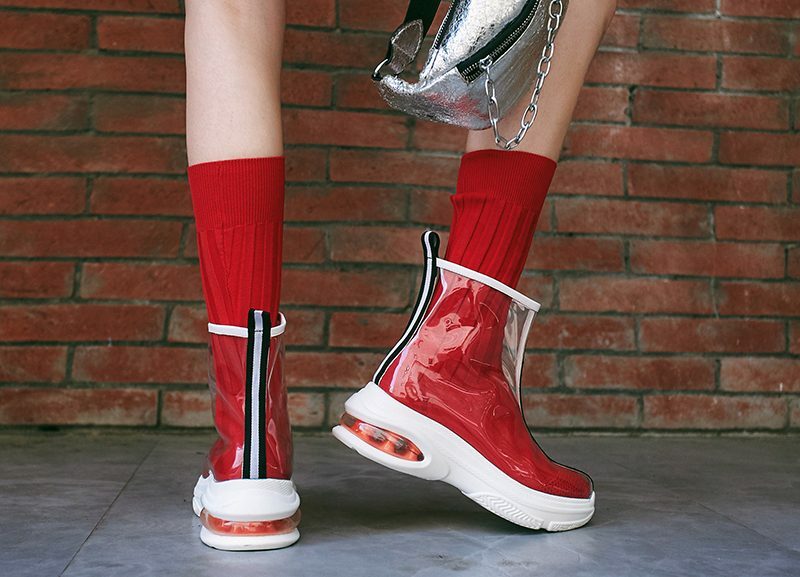 They have been designed in heels as well, but these lovelies are in sneaker boots form which looks really modern when worn with colorful socks, like the one shown in the picture above. It has a zipper at the back with a rubber sole and a round toe front. Combat style shoes have been highly inspired from army soldiers that wear these with their uniform on duty. They look extremely bold when worn with leggings and provide just the right amounts of warmth and protection to the feet. They have a lace-up front with a sneaker lug sole that reaches slightly above the ankles. 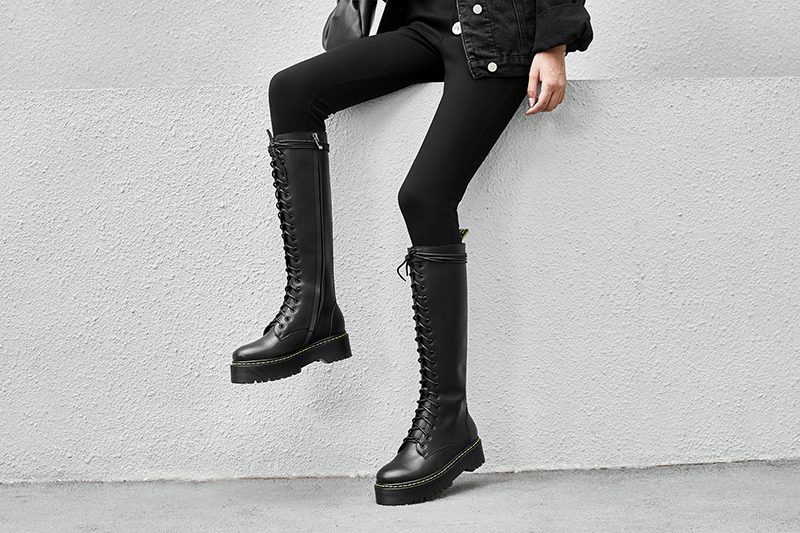 Flatform sneaker boots are a recent addition to this category which really is worth buying. These amazing shoes have a zipper opening on sides with a round toe and a rubber sole that is almost 2 inches high above the ground. They are available in metallic silver and black color.